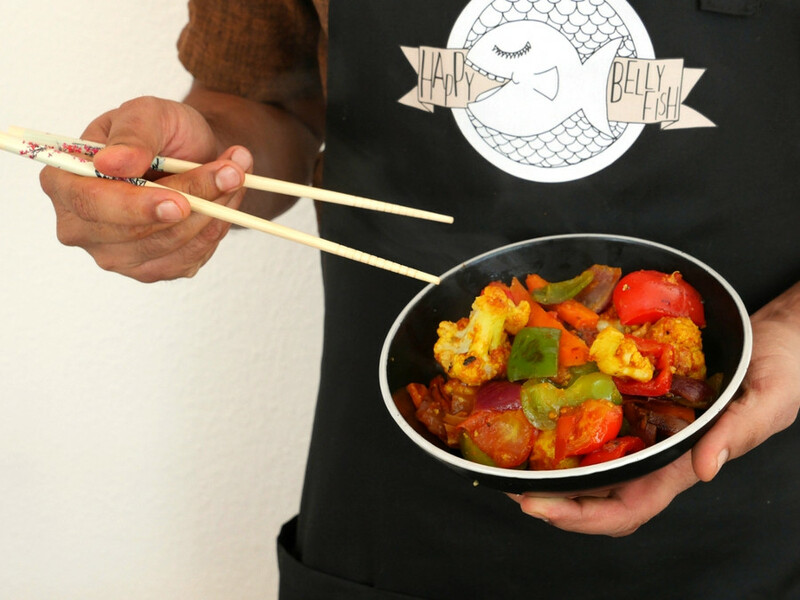 Our cauliflower recipe was inspired by a very popular Indo-Chinese street food named gobi manchurian, but we make it more light and healthy. Gobi manchurian is a fusion dish, that was invented by a Chinese cook in Kolkata, you can find it in many Indian restaurants. In most reipces it is deep fried, but you can easily avoid it, by following our healthy recipe. Step 1. Start with cutting the cauliflower. Take out the green part that you don’t need, cut the white part and then break it with your hands in medium-sized florets. Step 2. Wash the cauliflower, put it in the boiling water and cook for about 5-8 minutes. Step 3. Meanwhile, chop the carrots, bell peppers, onions and you can also add a green chilli pepper if you like it. Take equal quantity of garlic and ginger (1-2 tsp), peel them and then chop them in very small pieces. Chop the tomatoes and keep them aside. Step 4. When the cauliflower is cooked, take it out of the water and put it in a big bowl. Add 1 tsp of oil, about 2 tsp of wholewheat flour and about 6 tsp of corn flour. Then add some tumeric, about 1 tsp, and the same quantity of paprika or red chilli powder. Add a bit of water and mix it well. Don’t forget some salt! Step 5. Heat 1-2 tsp of cooking oil in a big pan, keep it in the medium heat. Add the cauliflower, cover the pan and cook for 5-6 minutes mixing it from time to time. It is ready when cauliflower starts getting a golden color. When the cauliflower is cooked, take it out of the pan. Step 6. Add again some oil in the pan and start cooking vegetables. Add ginger and garlic, cook them for a couple of minutes until the smell starts coming out, and then add the remaining vegetables, except tomatoes. Cook them for a few minutes, than add the chopped tomatoes at the very end. When tomatoes start to soften, add some salt, give it a good mix and then add the cauliflower. Step 7. Mix your vegetables well and add 6-7 tsp of white vinegar and about 9 tsp of soya sauce. Stir fry it for 2 to 3 minutes more, so that all the flavours can blend together. Your healthy gobi manchurian is ready! Enjoy!